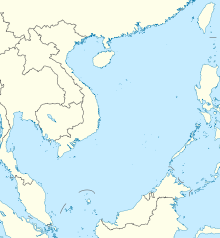 Johnson South Reef (Chinese: 赤瓜礁; pinyin: Chìguā Jiāo; Vietnamese: Đá Gạc Ma), also known as Chigua Reef in China, Gạc Ma Reef in Vietnam and Mabini Reef in the Philippines is a reef in the southwest portion of the Union Banks in the Spratly Islands of the South China Sea. It is controlled by the People's Republic of China (PRC), but its ownership is disputed by the PRC, the Philippines, Taiwan, and Vietnam. Johnson South Reef lies adjacent to the Vietnamese-controlled Collins Reef (also known as Johnson North Reef) which lies 6.4 kilometres (4.0 mi) to the northwest. It is naturally above water only at low tide. Prior to 2014 it housed a number of small buildings, wharves and a fortified Chinese maritime observation station. On 12 July 2016, the tribunal of the Permanent Court of Arbitration concluded that Johnson Reef contains, within the meaning of Article 121(1) of the United Nations Convention on the Law of the Sea (UNCLOS), naturally formed areas of land, surrounded by water, which are above water at high tide. However, for purposes of Article 121(3) of UNCLOS, the high-tide features at Johnson Reef are "rocks that cannot sustain human habitation or economic life of their own and accordingly shall be entitled to 12nm of territorial sea measured from its baseline but have no exclusive economic zone or continental shelf". 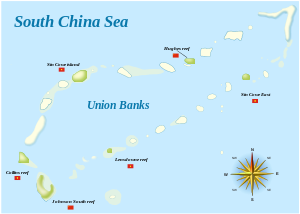 Johnson South Reef has been occupied by the People's Republic of China since 1988, and is claimed by Vietnam. It was the site of the 1988 Johnson South Reef Skirmish between the PRC and Vietnam that resulted in the death of 64 Vietnamese soldiers, two Vietnamese boats being sunk, and the Chinese occupying the reef. The PRC government constructed an embankment building on the reef in the early 1990s. In July 2012, to further reinforce their claim, a Chinese fleet of 29 fishing vessels from Hainan protected by Yuzheng 310 (a fishery administration patrol ship) spent 20 days fishing in the region. During 2014, Chinese reclamation work expanded the usable surface area to 10.9 hectares (27 acres), accommodating what appears to be a military and radar base and a small harbour. In late 2016, photographs emerged which suggested that the expanded reef has been armed with anti-aircraft guns and a CIWS missile-defence system. ^ Malig, Jojo (17 July 2012). "Chinese fleet eyes bumper harvest". ABS CBN News. Retrieved 29 October 2013. ^ "China fishing fleet arrives in Spratlys". Philippine Inquirer - Global nation. 17 July 2012. Retrieved 29 October 2013. ^ "Vietnamese activists remember 1988 Spratly Islands clash with China". Deutsche Welle. Retrieved 16 March 2016. ^ "30-vessel China fishing fleet arrives at Nansha Islands". Xinhua English - Sina English News. 15 July 2012. Retrieved 29 October 2013. ^ "Johnson reef tracker". Center for Strategic and International Studies. Retrieved 2016-03-05. ^ "China's New Spratly Island Defenses". Center for Strategic and International Studies. 2016-12-13. Retrieved 2016-12-17. Our World Flashpoint: South China Sea, BBC, film documentary, July 2015. This page was last edited on 16 March 2018, at 10:04 (UTC).